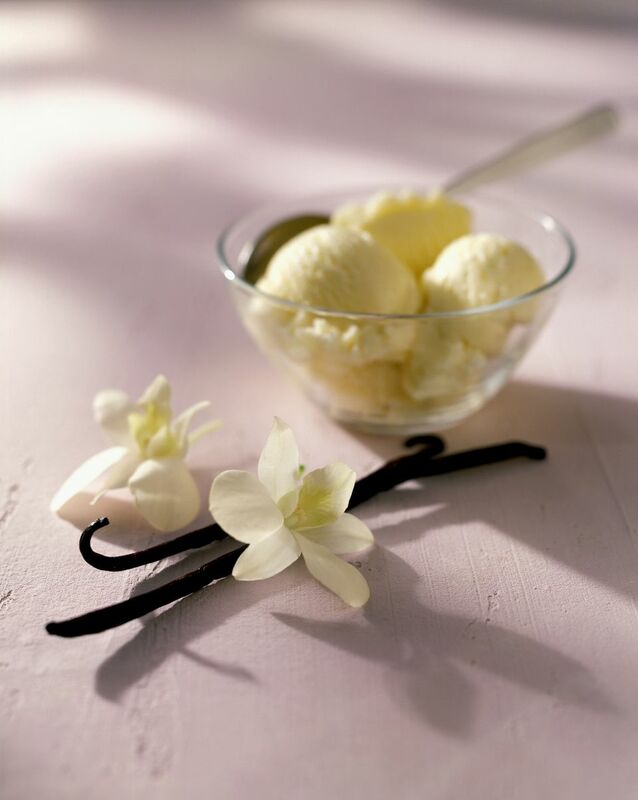 This fabulous, creamy ice cream calls for gum mastic, that gives it an almost chewy texture, and salep, used as a thickening agent. Both give the ice cream a unique taste. Golden gum mastic from Chios (mastiha) may be available through Greek grocers, and salep (salepi, sahlep, sahlab - a powder made from the root of an orchid plant) may be available from Greek, Egyptian, Lebanese, Turkish, or Kosher markets. This is a smoother preparation than the Turkish dondurma. Grind the mastic: mastic is usually sold in drops of resin which can stick to the mortar and pestle during grinding. To avoid, freeze mastic for 15 minutes before using and place it along with 1-2 tablespoons of the sugar in the mortar. Grind with the pestle. In a mixing bowl, beat 1/2 cup of the milk with the ground mastic (and sugar used to grind) until completely blended. Dissolve the salepi in 1/2 cup of cold milk. Warm the remaining milk in a saucepan over low heat. Beating the mastic mixture at high speed, add the warm milk, then the dissolved salepi. Add remaining sugar and cream. Transfer the mixture to a saucepan and boil over low heat for about 20 minutes, stirring frequently to prevent sticking and clumping. Remove from heat and set aside to cool to room temperature. Ice cream maker: When cooled, transfer to ice cream maker and freeze according to manufacturer's instructions. Without ice cream maker: Transfer to a metal container, cover with a tightly fitting lid or foil and place in freezer. Every half hour, remove from freezer, transfer to a mixing bowl and beat with a hand mixer until frothy. Quickly place back in the metal container and put in the freezer. Repeat three more times. Serve alone, with a syrup topping or spoon sweet, and sprinkle with chopped almonds. Kaimaki is also served with syrupy sweets like karythopita (Greek walnut cake). Note about buying salepi: The most common form available has been premixed with sugar and other additives. The best salepi for this recipe is the pure ground orchid root if you can find it. If not, use 4-5 times the amount of salepi called for in the recipe and decrease the sugar to 1 cup.